This story was written by Clark Durant. It's early 1987. Jack Kemp is at our home near Detroit on one of his many Michigan visits from 1985 to 1988. We are recruiting precinct delegates, county and district chairs in a ground game for 1988 presidential delegates. My 5-year-old son runs into the room with a small silver cowboy gun and red cowboy boots. And Jack just entertains young John as if he were one of his own boys. And, on command, everybody puts their hands up! Jack and I met on the Platform Committee of the Republican Party at the national convention in Dallas in August 1984. I was 35. We had a blast. The platform was rich in the ideas of hope, prosperity, and peace. And, no tax increase!, despite the wiggle room Drew Lewis, Bob Dole, and others wanted. Gingrich. Lott. Kasten. Weber. Hyde. Schlafly. These were the movement players. But, Jack was our leader. Money as good as gold. Reduce taxes to prosperity, to break the cycle of poverty, and to create more capital for the working man and the poor. And, urban homesteading, just like Lincoln. It was morning in America. Ronald Reagan's steady hand had steered our ship of state out of the darkness, despair, and misery of the Carter years into a safe harbor of opportunity and freedom. 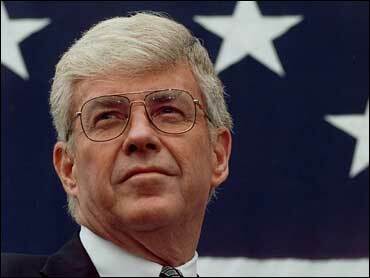 But, it was Jack Kemp who drew the map, tended the lighthouse, and cleared a wider shore for all to know freedom. The seeds for "Mr. Gorbachev, tear down this wall" were planted in that platform by Jack, the co-chair of the foreign policy subcommittee. I was in a hotel room in Chicago last week. I couldn't sleep. It was 3:30 a.m. I turned on Sports Center to see if the Tigers had won the day before. (I once asked Jack if he liked baseball. "Nope, no quarterback", he said.) There on the screen was Jack's picture with the years 1935 - 2009 just below. The dreaded image. I shuttered for just a moment. All knew it was coming. Now it had, only nine hours before to a friend, and a good man, father, and husband. The quick story was upbeat (could it be any other way with Jack?) and covered the sports and public life essentials. But, as I was sifting through my dusty basement boxes last night, I was reminded time and again what a wonderful gift Jack's life had been to me, my family, and countless others over the years. For 1988 Michigan had adopted an outlier process to decide presidential delegates, even before Iowa and New Hampshire. Jack visited the state, alone and with others, in the next three years as if he was Paul the evangelist. (But, he avoided a Friday night or weekend event. He wanted to get home to be with his family and loved watching his sons play football.) Like Paul, he built hearts and minds of true believers, and not just for an election cycle. And, like Paul, he journeyed where the faithful had not gone before. We did labor union halls, city churches, and urban schools. And, if we ended the day generating funds in the home or club of a well connected friend, it was always the same message everywhere: prosperity is rooted in freedom not privilege, lower tax rates create growth and upward mobility, and politics is helping people have more control over their own lives. In our old green station wagon I travelled with three of our children to Iowa for a long Thanksgiving in 1987. We visited cities and little towns, worked shopping malls, senior residences, and popular restaurants. The kids were interviewed by small town newspapers. Jack called me from Washington and asked how we got the great coverage. "Jack", I said, "whoever turns down an interview with an 11, 9, or 7-year-old, particularly to find out why they have travelled so far and worked so late with silly, but colorful, homemade signs and t-shirts saying Kemp for President?" They could repeat Jack's favorite lines: politics is for everybody, ideas matter, freedom brings prosperity, and we must be the party of Lincoln. Jack didn't get the nomination in '88. But the ideas he stood for (tax cuts across the board, enterprise zones, freedom around the globe, the value of every human person, born and unborn) helped Ronald Reagan become president, and the ideas still resonate. They can and should inform our contemporary politics. The last time I saw Jack was when he and Joanne came to our home for lunch during the Super Bowl of 2006. There is a Churchill picture in my library. Jack looked at the picture. He turned to me and said, "now there was a man of destiny". Jack, my friend, so were you. Great game. Your best. And everybody has their hands up. Clark Durant is CEO of the Cornerstone Schools in Detroit. He served as one of the four national co-chairs in Jack Kemp's 1988 presidential campaign.